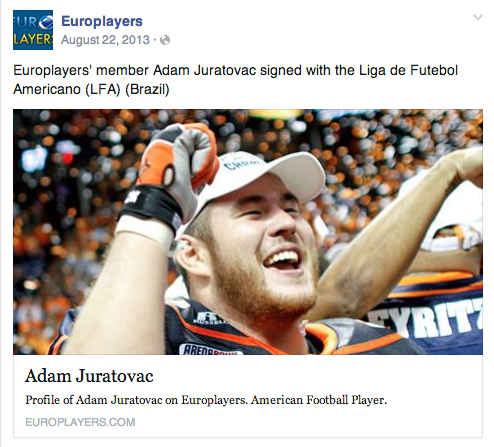 The first time I heard Daniel Levy’s name was in June of 2013 after I signed to play professional football in Brazil. Daniel was the head coach of Missão Paraná team in the Liga De Futebol Americano (LFA), the first professional football league in Brazil. He was going to make a childhood dream come true, make me a First Round Draft Pick. But before he could do that the league abruptly folded (turns out it’s pretty hard to start a professional football league, you hear that XFL?). That ended my Brazilian dreams but it was just the start of Daniel’s. He utilized the LFA limelight to become the most sought after football coach in Brazil and ultimately chose to coach the Vila Velha Tritões (Vila Velha, Brazil). Coach Levy sent me his writings and I quickly found that playing for pizza is not what you’d expect. I’ve edited Coach Levy’s writings into a four-part mini series that chronicles his time coaching abroad and his experiences Living the Dream. Here is Coach Levy. I'm Coach Levy. With the World Cup opening next month, American football in Brazil is now entering a period of “reprieve”—two whole months without any games, thus leaving me with a lot of time to reflect on my experience thus far. But if someone asked me this question right now, at this very moment, and I had to speak from personal experience, I would immediately hearken back to February of this year when I arrived in my newest home of Vila Velha, Brazil. Returning to my apartment after my first practice with the team, I sunk into my couch, eyelids sagging under the weight of lingering jetlag. With the ocean breeze washing in through my balcony, I opened the Duty Free bag, poured a very, very large glass of whiskey, and asked, “what the hell have I gotten myself into?